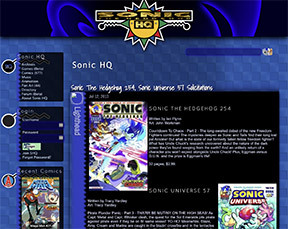 Sonic HQ or SHQ is a Sonic The Hedgehog fansite that has been around since 1998 and has since been a source of information for comics, games, music and other media. 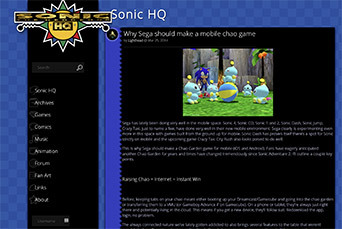 Sonic HQ was the first site to announce Sonic Adventure, conduct interviews and have a Q&A. 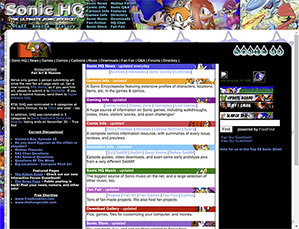 Sonic HQ was most popular 2000 - 2004 after which updates became more sporadic. 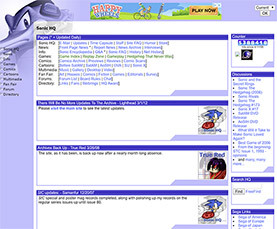 Around the dawn of the internet, (or just June 26, 1997) this site sprang forth under the name "Zifei's Sonic Page". Zifei was the owner at the time and the original creator of Sonic HQ. It wasn't until April 11th, 1998 that it got renamed Sonic HQ. Zifei stepped down September 1, 1999 to pursue another dream and left the site to the hands of Jon Gray "WB" and Vector. 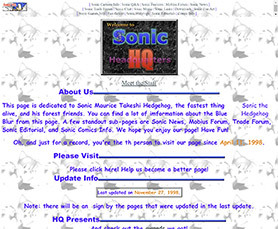 During this time we also got a new redesign developed by Zifei, Vec and WB along with our own domain name at sonichq.org on April 11, 2000. SHQ was at its prime during this time. WB stepped down April 20, 2001. After WB moved on, Vector took charge. The site did really well at first but then started to stagnate as updates came less frequently. A new version of the site, completely recoded by Vec, sprang forth on September 12, 2003. It's now the archive site. At this point there were barely any updates at all. SEO declined. Traffic declined. The site became an archive site. 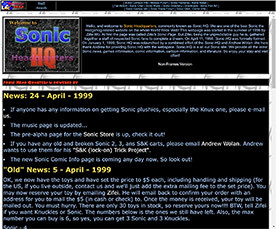 There was a 1 month black out period and the domain sonichq.org was lost. 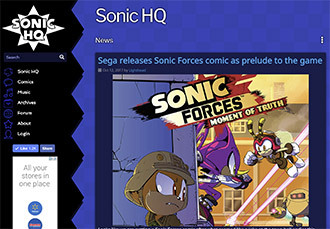 The site returned at sonic-hq.net but the damage was done. The checkers era because the background has only been blue checkers. This era saw a new person take ownership, Lighthead. And so just who am I anyway? 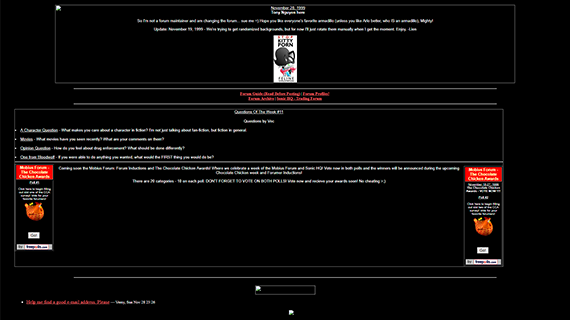 Well, if you look at this old staff page on the older version of the site, I was a random news maintainer/encyclopedia profile writer. I also maintained the music section somewhat. During this era, the site tried to regain new footing in a new internet. I rechristened SHQ as the MySpace of Sonic Sites. Partial kidding aside, the comics page and music page were completely redone. 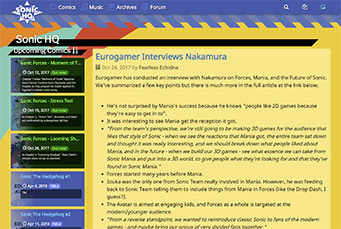 Overall, the site became a content site for comics and music first and news site second. As of October 2017, we start a new era. The MF started as a tiny board at serverapps which had a threaded layout. There were no user accounts. You could even freely use HTML in the topic titles. 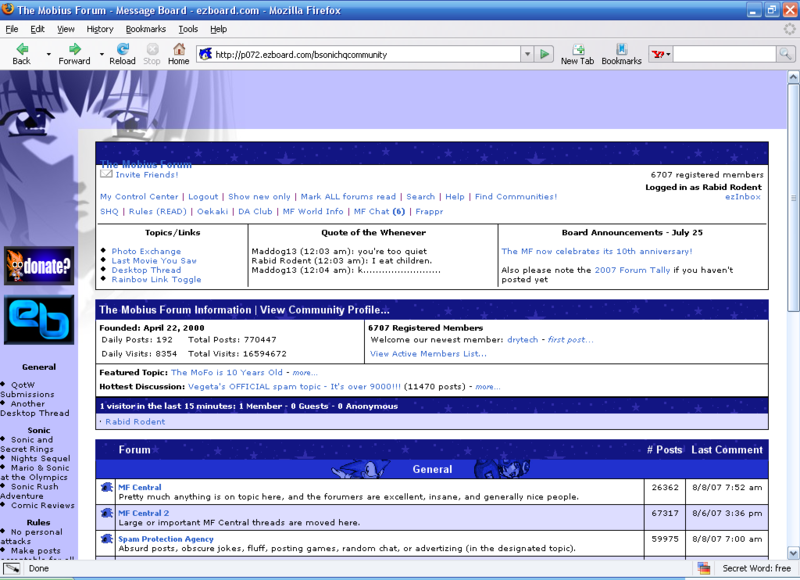 Once the forum got big, new forum software became paramount. We got user accounts, WYSIWYG editors, multiple forums, avatars and more. In 2005, Ezboard was hacked terribly and we lost half of all our posts. Ezboard was written in SmallTalk and not really maintained and so forum software that was written in a more modern language was necessary. 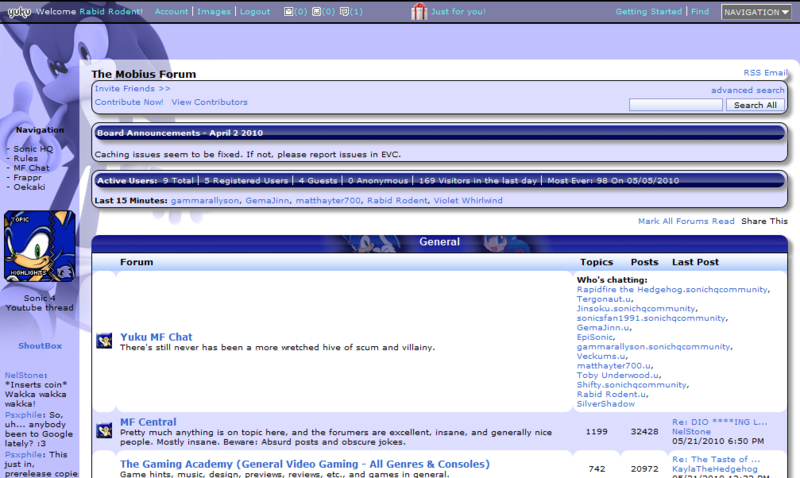 They slowly migrated forums from Ezboard to their new platform, Yuku. Yuku later got bought from a company called CrowdGather. 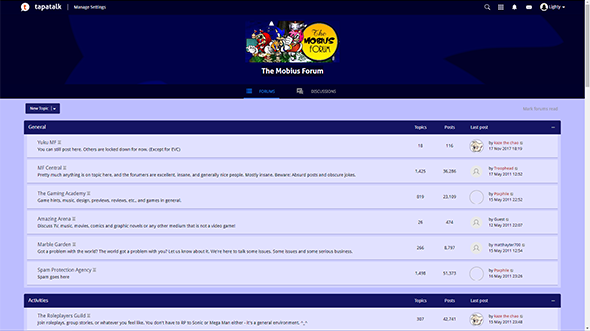 Wanting control of our own data, the forum moved from a proprietary hosted forum to self hosted exploring phpBB and SMF. Ultimately, due to staffing issues and neglect, the board relocated back to Yuku which then later was acquired by Tapatalk in 2017. This website uses "cookies" to better enhance the functionality of the website. Your IP address is collected via daily server logs. These cookies may respond to visits on other websites. This website does not record data related to these cookies. You may opt out of the use of these cookies by visiting Google's advertising opt-out page.